These Sennheiser microphones have been designed specifically for mounting on a camera to provide an input signal of improved quality, compared to that produced by the integrated microphone on most cameras. This is a compact, dust, mud, snow, wind and water resistant (1m for 30minutes) microphone designed to fit the GoPro HERO4 camera - useful for mountain biking or snowboarding action videos. The omnidirectional microphone capsule ensures audio pickup is from all directions; it is mounted on a soft shock-mount to reduce rumble pickup. 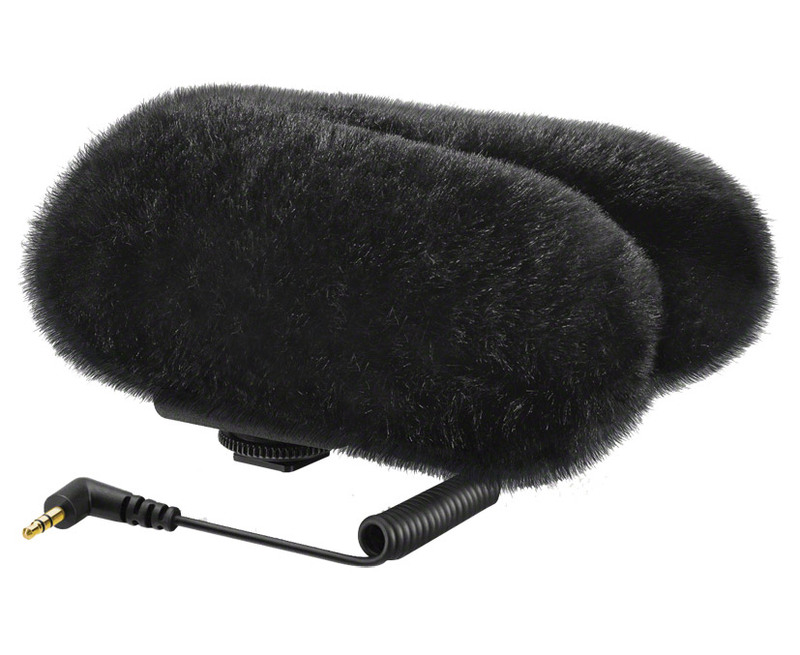 A water and wind sheild fits to the microphone with a push-and-twist action. Connection to the GoPro HERO4 is via a clip-on 'BacPac' 'Backdoor' shockproof module which clips onto the camera.The microphone connection is then made with a micro USB connection to the GoPro body. 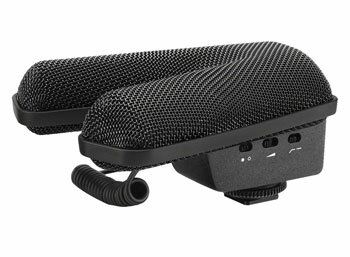 The the additional GoPro battery pack can still be used, which fits in the Sennheiser rear cover, or one of the two included spacers may be used. Optional accessories: MZH 2 windshield. The MKE 440 is a compact, stereo, microphone 'for cameras with a lighting-shoe mount and external microphone input'. It has dual miniature shotgun capsules, mounted in a 'V' configuration to 'create frontal focus' and provide 'maximum side noise rejection'. The two super-cardioid microphones are mounted in an 'all-metal' housing, protected by a 'built-in elastic suspension' and a dual-mesh windshield. The microphone mounts on the camera accessory shoe and connects by a short, coiled cable with three-pole, 3.5mm jack plug. Controls: There is an on/off switch; signal level to the camera is adjusted with a three-level switch; a 'low cut switch minimises wind and handling noise'. Maximum sound level: 132dB SPL. Response: 50Hz - 20kHz. Power source: 2x AAA cells, providing more than 100 hours use. Operating temperature: -10 to +55 degrees C. Dimensions: 67 x 106 x 128mm. Weight: 165g without batteries. Optional accessories: The MZH 440 fur windshield is offered for out-door use. Batteries; see AAA batteries, 4-pack and see AAA batteries, 10-pack.